Called the "Red Decade" by some journalists, the 1930s saw a surge of popular interest in radical ideologies and organizations, including the Communist Party. This special section brings together detailed histories, illustrated research reports, photographs, documents, and maps to explore the various forms of radicalism that surfaced during Washington's Great Depression. Click on the links in the box to the right to explore different aspects of Northwest radicalism. Nowhere was the left more influential than Washington State where radicals played a major role in rebuilding the labor movement and reorienting the state's Democratic Party. Right-wing organizations also gained adherents, including the Legion of Silver Shirts, an avowedly fascist organization. Washington had a long tradition of labor radicalism dating back to the Knights of Labor in the 1880s. In the first decades of the 20th Century, the Socialist Party developed a strong base in both eastern and western Washington while the IWW attracted members and attention in the lumber camps and mill towns, as well as in the cities. The Seattle General Strike of 1919 cemented the state's reputation as a place where socialist movements and radical labor unions were active and influential. But the left had come apart in 1920s. The World War I Red Scare nearly destroyed the IWW, and the Socialist Party never recovered from the 1919 split that created the Communist Party. By the time the Seattle Union Record, the socialist-leaning daily newspaper owned by the Seattle Central Labor Council, folded in 1928, the radical movement had lost its way. What remained were small parties and factions that spent much of their energy fighting each other. 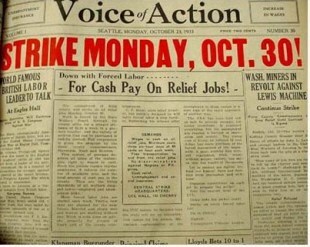 The economic crisis of the early 1930s reawakened the state's radical movements. 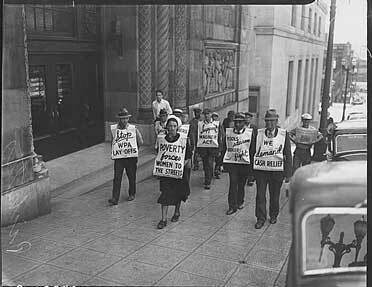 As unemployment surged, a group of former socialists in Seattle launched the Unemployed Citizens League to demand government assistance. Thousands joined and by 1932 the UCL had established neighborhood clubs throughout Seattle and other Puget Sound cities. Independent radicals launched a second bold initiative in 1934, running candidates in Democratic Party primaries under the banner of the Commonwealth Builders Inc. (CBI). Affiliiated with Upton Sinclair's End Poverty in California initiative, the CBI sought to elect state officials who supported their plan to establish cooperatively owned farms and factories. "Production for Use" instead of production for profit was the enticing slogan of the new organization. Reorganizing in 1935, the renamed Washington Commonwealth Federation (WCF) would become a major political force in Washington State. With tens of thousands of supporters, the WCF turned the Democratic Party to the left while electing radical candidates to the legislature and to Congress. The Communist Party had been small and isolated prior to the Great Depression. Highly disciplined and scornful of other radical groups, the Party attracted much attention and some new members in the early 1930s through its Unemployed Councils, a militant organization that competed with the UCL. In 1933, the CP began publishing the Voice of Action, a lively and loud Seattle-based weekly newspaper and its effectiveness increased. Even before the Communist International in Moscow officially declared in 1935 a new strategy of cooperating with other progressives, the CP in Washington had been building its own "popular front." Party members joined the Washington Commonwealth Federation and sometimes took leadership roles in the new unions that emerged starting in 1934. Never a mass organization--CP membership in the state rarely exceeded 2,000--the Party nevertheless was uniquely adept at organizing their way into influential positions in unions and coalitions like the WCF and the Washington Pension Union. Important too was their role in promoting civil rights activism in the 1930s. The Voice of Action, the Communist Party's influential newspaper, begun in 1933. The left had many dimensions, including a partially revived Socialist Party, a residual but active group of IWWs, and Trotskyists affiliated with what became the Socialist Workers Party in 1938. Unaffiliated radicals outnumbered all of those who followed particular parties and that makes it hard to precisely define and count the 1930s left. Where earlier in the century, the Socialist Party had provided the big umbrella covering much of the left, in the 1930s radicals worked in unions, unemployed organizations, civil rights coalitions, and most of all inside the New Deal Democratic Party. This influence would be sharply reduced in the late 1940s. As the Cold War with the Soviet Union turned into a red scare in the United States, radical organizations, especially those linked to the Communist Party, faced persecution and marginalization. The red scare came to Washington State when Albert Canwell's Joint Legislative Fact-Finding Committee on Un-American Activities began to investigate communist influence at the end of 1947. Though the left-wing movements were far more visible and effective, Washington State also saw the emergence of conservative and fascist organizations with their own responses and solutions to the crisis. The New Order of Cincinnatus, launched in 1933, gained legitimacy throughout the state, while providing future governor Arthur Langlie with his start in politics. Attacking high taxes and championing moral and political reform, the organization drew fire from the left which saw it as a potential vigilante or proto-fascist threat. Those fears proved unfounded. Worries about the fascist commitments of the Silver Shirt Legion of America, however, were well-placed. The Silver Shirts drew their inspiration and paramilitary style directly from Italian fascism and German Nazism, and Washington State hosted one of their largest chapters. The New Dealer was the final paper, from 1938-1942, of the radical-labor political coalition, the Washington commonwealth Federation.